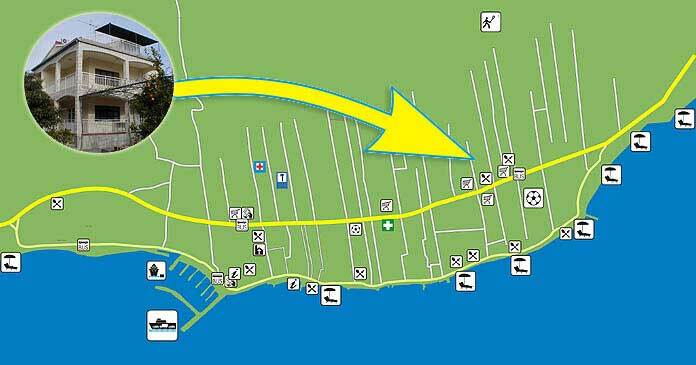 Cibilic apartments location - How to reach Orebic? You will find our house easily following the map above.č You can reach the house from the both side streets, although it's more convinient if you take A.G. Matos street from the main one. How to come on Peljesac, how to reach Orebic? Although it has all natural and cultural characteristics of Adriatic island, Peljesac is easy enough to reach with own car, without need to worry about ferry or other public transportation schedules. If you are coming from direction of Zagreb, you either go over Split or Makarska then to Ploce. Depending of country you're coming from, you may take an alternative route trough Bosnia and Hercegovina to Metkovic near Ploce. Coming from Ploce to Peljesac is possible either using ferry to Trpanj on Peljesac (Jadrolinija) or with own car trough Neum (B&H, free pass trough or only brief stop at the customs) then trough Ston. Nearest airports are Dubrovnik (about 120 km) and Split (about 230 km) - they are connected with most European metropolas.